They Fell In Action Seventy Miles Apart But Are Now United In Death. 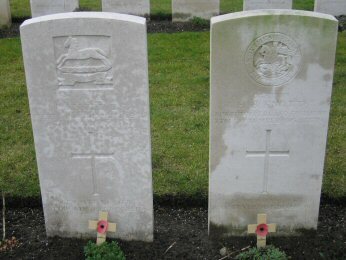 If you visit Ypres Reservoir Cemetery you may notice the graves of Major James Leadbitter Knott and Captain Henry Basil Knott buried side by side in plots referenced VB 15 and VB 16. The story of how these brothers from the north east of England came to lie where they do today was a most unusual if not unique event in the years after the conclusion of the Great War. The brothers were the sons of Sir James Knott and Lady Margaret Annie Knott, Sir James having risen from his first job as a shipping clerk on Newcastle's quayside to form one of the world's biggest shipping companies, the Prince Line. The Prince Line gave him vast wealth and in the preceding years he also owned coal mines, studied law and was called to the Bar as well as serving as MP for Sunderland in 1910. He was quite rightly described as one of the merchant giants of the time. The first son James Leadbitter Knott was born on December 2nd 1882 when the family was living at Frank Place in North Shields. 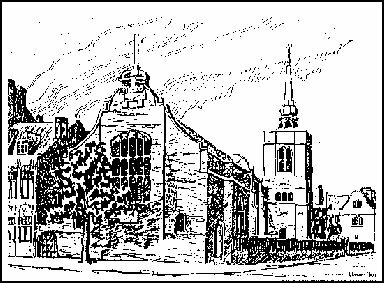 Educated at Eton College James Knott then travelled extensively mainly in the USA as part of his training to see how his father's business interests were run. He was said to have inherited a great commercial ability and also had aspirations to enter politics becoming the prospective Unionist candidate for the Hyde Division in Cheshire just prior to hostilities. At the onset of war in 1914 James Knott applied for a commission and was accepted into the 9th battalion of the Northumberland Fusiliers with whom he travelled to France later transferring to the 10th battalion of the West Yorkshire Regiment. In March of 1916 the Hyde Division wrote to Major Knott enquiring if he would be prepared to return to England and contest the parliamentary seat which had become vacant. He replied that "Party politics were of little significance at that time and that his duty was in France." He was awarded the DSO in the Birthday Honours of June 3rd 1916 and it was just after this that perhaps with a sense of foreboding for the upcoming Somme offensive he wrote a moving letter to his parents marked, "Only to be sent in the event of my death." "This letter is not a message from the grave, I know that I will be with you when you are reading this I hope and desire above all things that you will not unduly grieve. My medals are yours but I would like them destroyed when you both join me. My clothes, furniture and motor car must be immediately disposed of, everything which reminds you of my death must be removed. This is my urgent desire and wish." On the morning of July 1st 1916 as the Battle of the Somme opened Major Knott was second in command of the 10th West Yorkshires and was with his men in their jumping off positions facing the German lines in the heavily fortified village of Fricourt. At 7-28am three mines were detonated at a position known as the Tambour and at 7-30am Major Knott and the battalion advanced in lines passing quickly over the German front line but as the smoke cleared found themselves caught between the enemy's front and second positions as the German defenders emerged from their dugouts and opened murderous machine gun fire on the West Yorkshires advance parties and their support which was following up. The casualties sustained by the battalion were the highest in the British army for a single day throughout the war totalling over 700, among them Major Knott killed in action leading his men forward. When that fateful day was over James Leadbitter Knott was buried close to where he fell in Fricourt New Military Cemetery along with his commanding officer Lt Col Dickson and many of his men. The second son Henry Basil Knott was born on February 5th 1891 when the family were living at the Manor House in the Jesmond area of Newcastle. Henry Knott was tutored at home in his early years followed by attendance like his brother James at Eton College. Shortly after the declaration of war Henry Knott applied for a commission which resulted in him joining the Northumberland Fusiliers as a 2nd Lieutenant in September of 1914 and undergoing training in England where he was promoted to Captain before travelling to France on July 15th 1915. Described as a most capable and popular officer and clever caricaturist, Captain Knott and the battalion spent the remainder of July and the early days of August being introduced to the vagaries of trench warfare before moving into the line on the southern edge of the notorious Ypres Salient. On September 6th the 9th Northumberlands were in the line at Bois Carre, a small wood close to the village of Vierstraat. It was here close to a position known as the Western Redoubt that Captain Knott received a bullet wound to the head resulting in him being taken by ambulance to Poperinghe where he died of his wounds at No 10 Casualty Clearing Station at Remy Siding at 1-40am on September 7th. The file on Henry Knott at the National Archives reveals that his father Sir James received a letter in November of 1915 stating that his son was buried in "the new cemetery near Poperinghe" which is however seven miles west of Ypres where he lies today and the map references given in the letter equate to burial in Lijssenthoek Military Cemetery very close to Remy Siding where he died so this would seem to fit in with the burial practice of the time. It is my belief that at the end of the Great War Henry Basil Knott was lying in Lijssenthoek Military Cemetery while his brother James Leadbitter Knott had Fricourt New Military Cemetery as his resting place seventy miles from his brother. It is here that supposition comes into the story as to the exact sequence of events that followed but it would appear that in the early 1920s Sir James Knott used his considerable importance and influence to get the bodies of his sons exhumed and moved to where they lie today side by side in Ypres Reservoir Cemetery. "Devoted In Life In Death Not Divided"
Just down the road from the cemetery stands St Georges Memorial Church built after the war the tower of which was funded by Sir James Knott and inside a plaque to his sons can be seen. The brothers are also remembered in their native north east of England on memorials at Cullercoats, Wylam and Heddon and at the church of St James and St Basil named and built by their father at Fenham as well as the memorial park in Heddon built in their memory and opened in 1925. Sir James Knott died in 1934 but the trust that he founded and which still bears his name continues to make payments to charities to this day.